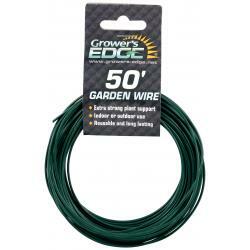 Use Grower's Edge® Garden Wire for tying plants, vegetables and vines to stakes and trellises. Sturdy and durable. Great for all kinds of gardening. Comes in a 50 ft roll. Support plants easily. Same great Sun Spool but now features two convenient hooks and a non-removable stopper. 60 inches of retractable line. Durable plastic housing. Quickly and easily secure plant stems to garden stakes. Allows room for natural plant movement and growth. Weatherproof clip with stainless steel spring. Choose from large 1-3/4 in or small 1 in size. Ideal for tying plants, vegetables and vines to stakes and trellises. Plastic coated for gardening. 164 foot roll with built-in cutting tool. Ideal for tying plants, vegetables and vines to stakes and trellises. Plastic coated for gardening. 164 foot roll or 328 foot roll with built-in cutting tool. Soft foam, flexible garden plant tie. Use to attach plants to bamboo or wire support racks without damaging your plants. 5mm in diameter by 16 feet long. Comes on a spool with a built-in cutter. 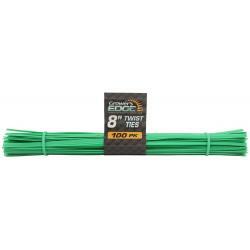 Twist tie is ideal for tying up plants, vegetables and vines. Plastic coated for gardening. Cut to any length using the built in easy cutter. 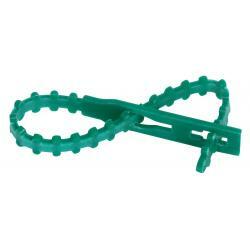 Grower's Edge Black Crop Clips are plastic and work great to support your plants while they grow. Simply attach the clip around plant vine and then to a support system such as stakes or trellis. Easy to use and completely reusable. These plastic clips work great to support your plants while they grow. Simply attach the clip around the vine and then to a support. Use with Reel-Enz spool. Sold in bags of 100 only. Supports plants easily with up to 60 inches of retractable line. Heavy duty plastic housing. Made in Holland. Supports plants easily. 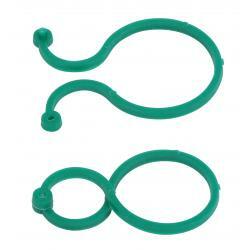 Features a convenient hook and a non-removable stopper. 60" of retractable line. Durable plastic housing. Plant Ties are an easy way to train vines or support plants. No knots required. The plant ties are adjustable, UV resistant and durable. Plant ties wrap around your plant and back onto themselves for a secure self-gripping hold. Ties plants with a simple squeeze. For plants, vines and small trees. Use Tape Gun with Machine Staples, Blades and Tie Tape. Each item not included and sold separately. Replacement Bond tie tape and staples. 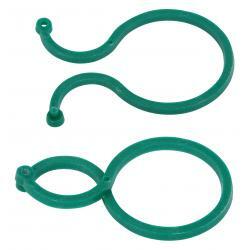 Secure plants and vines for use with Bond TieRite Tape Gun. Replacement Bond Tie Tape and Staples. Secure plants and vines. For use with Bond TieRite Tape Gun.